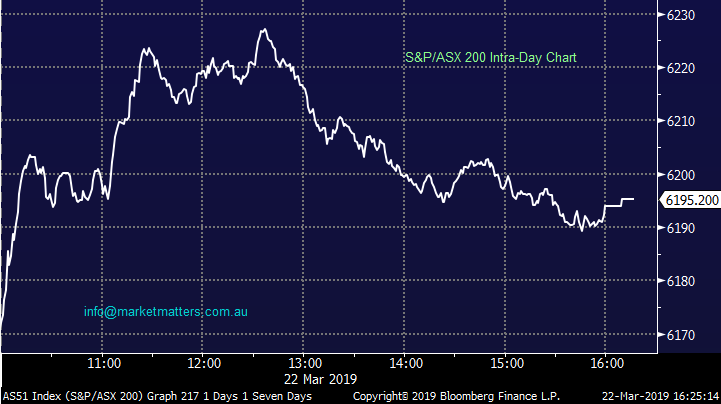 The market took its bullish que from the US overnight with stocks having a belated response to the Feds dovish commentary on Thursday – the Dow put on +216 points feeding into a bullish open in Australia and the market went on with – up until lunchtime at least. 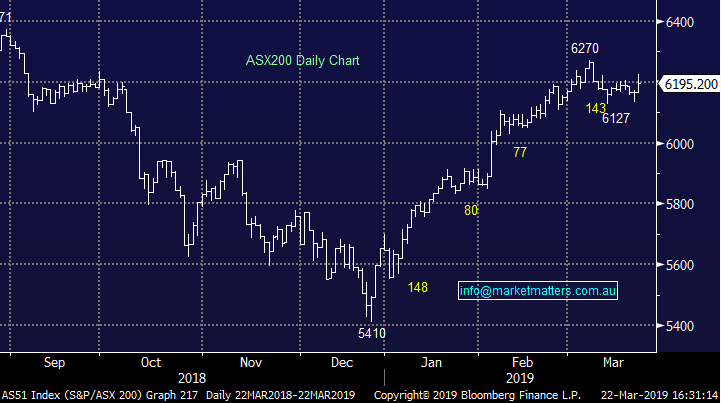 On the ASX 200, a break of 6200 saw short covering / new money come in with some decent buying of stocks, particularly some of the beaten down (dog) names rallied well – the index was strong into a lunchtime high of 6227, however that was as good as it got. Sellers then took the market by the scruff of the neck and pushed it back down below the 6200 handle. A weak close at6195 was 32 points below the intra–day high which is a more bearish than bullish day even though the market closed up. US Futures were trading marginally lower during our time zone while Asian market were also fairly soft. Overall today, the index closed up +28pts or +0.45% to 6195. Dow Futures are trading down -40 points / -0.15%. 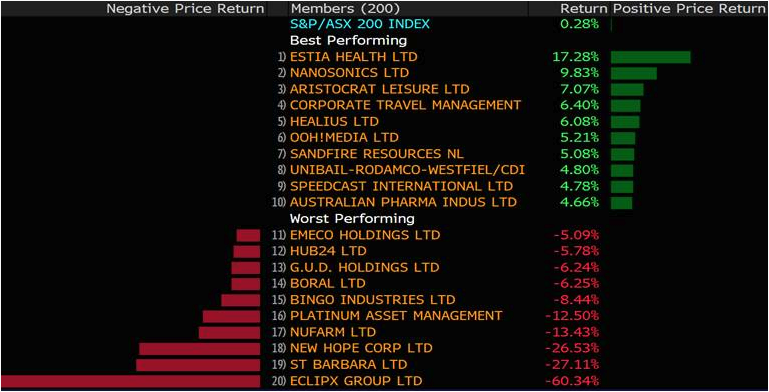 While the market was higher today, it was the recent laggards leading the charge with the likes of Syrah (SYR) +6.85%, Pact group (PGH) +6.25% which we added to this am in the MM Portfolio, Estia Health (EHE) continued to run up 4% and even Elders (ELD) +3.6% and Nufarm (NUF) +2.9% copped some buying. That sort of buying can be typical of a tired market – the index rallying on macro factors but stocks that offer ‘perceived’ value seeing most attention i.e. the leaders are expensive so focus on the laggards. 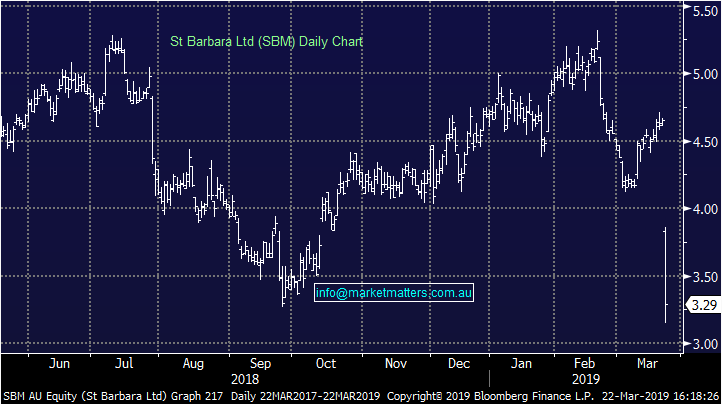 St Barbara (SBM) –29.25%, hit hard today after a downgrade to the current year’s production expectations, as well as a hit to any mine life extensions the market was hoping for to the Gwalia mine which is already 123 years old. St Barbara had been looking at ways to add years to the aging mine that in its current state would survive until the early 2030s, however today’s announcement all but ends the prospects of any extension to the 12 more years of production at Australia’s deepest mine. Add to this they also need to invest $100m into ventilation so that trucking the 1.1m tonnes of ore out each year can continue. For now, production will be limited until the additional ventilation is added, as such the miner was forced to downgrade expectations this year by 10,000 ounces to 235,000 to 240,000 ounces of gold. So production is slipping and capex will increase until eventually mining at Gwalia comes to an end – not a great story and the market dealt with it accordingly. 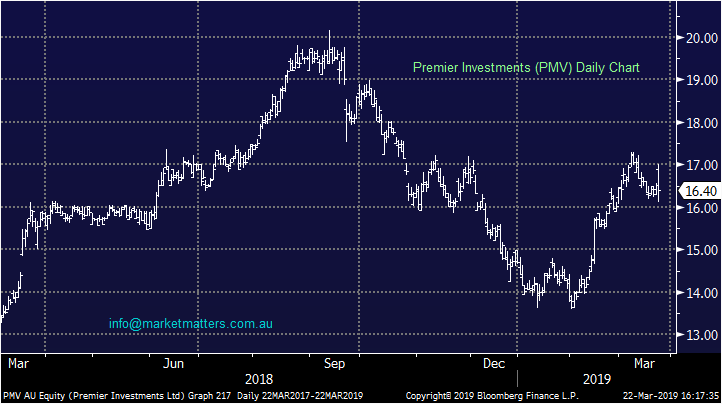 Premier Investments (PMV) -0.61%, was up early but that strength was sold into after they delivered what appeared to be a very strong set of numbers across most brands. The owner of Just Jeans, Jay Jays, Jacqui E, Portmans and Dotti chains along with the growth engine Smiggle, delivered both total sales growth and like-for-like growth during the period on all brands – so why the weakness in the stock? The market seems to be fixated with Smiggle which saw comparable sales growth of 4.8% in the first half, which was below expectations.